You probably already have one or two or a billion PCS binders kicking around your house. Somewhere. But did you know you should have a school PCS binder too? Instead of throwing even more papers into your already overcrowded PCS binder, make mini-binders to handle only the school stuff. First, print off the free worksheets and label pages from the Stress Free PCS Challenge Group. It’s free to join and runs February 19 to 24, 2018! Then punch holes on the left side of each main section page. These will help guide you to placing all your documents in the correct places inside of the school PCS binder. You could paste or glue the section pages right on to the dividers, but you don’t have to. Another option is to use the tiny label inserts that came with the dividers to label those, then put your section label pages right behind their matching divider. Essential Student Info: name/vital stats on the Parent Info Page from the Ultimate School Success Kit, birth certificate, SSN, custody paperwork, adoption records, etc. Keep your hole punch and your plastic sheets handy! After your school PCS binder is organized, it’s time to make sure it’s fully stocked and ready to work for you. Look above for information about what you might need to have in each section. Don’t forget that the School Comparison Worksheet is 100% free to download and can be used over and over again. For some of the documents, especially test results for students not in special education, you will need to contact the school. Per FERPA (a right you need to know about), parents have the right to view their child’s cumulative school records at any time. However, the school might charge you to make copies. Depending on how thick your child’s file is, this could get pricey. Don’t worry too much about getting official official copies. Those really will come from your current school once you are enrolling in the next school. Instead, focus on completeness. Ask for digital copies if possible instead of ones on “official” letterhead. Or offer to copy the file yourself, and bring in your own paper! Often a kind teacher or staff member will scan documents into digital files for you, or print on their computer. This is where it pays to have a great relationship with the teacher! Make sure your teacher relationship is amazing with the essential tips found in Talk to the Teacher! Once you have the copies in hand, place them in the correct location. This will help as you arrive at your next location. If you opted to become a School Concierge Service client, a lot of the communication has already been taken care of for you. All you need to do is is pop everything into your extra folder! Doing it solo? Reach out to the school before you move to grab copies of their enrollment forms to print and fill out along the way. Set up an appointment with the admissions office or clerk. Then, simply hand over your folder. Extracurricular: while military students have the right to try out or apply to join a club, it doesn’t guarantee a spot. Instead, wow the coaches, advisors, and other staff in charge with your child’s successes. Including letters of recommendation can really seal the deal, especially for competitve activities. Older students (middle/high school) should be requesting these from their coaches/advisors themselves. School Comparison Worksheet: it’s easy to get overwhelmed with all the rankings and school data out there. Instead, use a military-specific form to get a good big picture of a whole district or individual school. You’ll be able to compare, at a glance, at how schools are ranked, the way BAH shakes out, and commuting distance to base. You still have to do a little research, but having one done-for-you place to organize all your information is priceless (and actually, it’s FREE)! Don’t want to DIY the school search? Learn more about School Concierge Services today! When you use the Stress-Free PCS school PCS binder system, changing schools just got so much easier! Join the Stress Free PCS Challenge Group to learn other great tips and access free trainings for your next PCS. How do you prep for a smoother school transition? Share your best tips in the comments! Follow MilKids Ed on Twitter, Instagram, Facebook, and Pinterest. 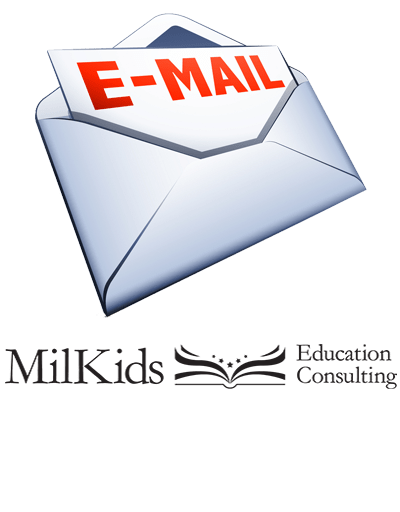 by joining the MilKids Ed email list!